This past December a spam caller started to phone me two, three, four, sometimes five times a day. Hitting "ignore call" each time is frustrating, so I searched for a better solution. I found built-in number blacklist in my Android phone. When a blacklisted number calls me, nothing happens. It's awesome. My phone doesn't make a noise and the screen doesn't turn on. But that wasn't the greatest solution - new spam callers would start calling, or existing spammers would call from new numbers... and the built-in Android blacklist wasn't the easiest to use. I found a great way to solve these problems with a smarter app that handles area-code identification and blacklisting. I found a fairly well-reviewed app called Instant Area Code. 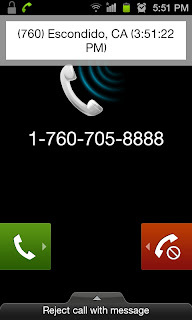 North American area codes are hard-coded into this app, so when you receive a call from a 604 number that's not in your contacts list, the phone will display "BRITISH COLUMBIA". Having the information hard-coded into the phone is a plus - it means that there is no delay showing you the area code location (some completing apps perform the lookup on the internet, so you have to wait a few rings for the location to show up). Here's a screenshot I took of my phone receiving a call that I placed through Gmail's web interface. You can see that the call is coming from Escondido, California (where Google must route their Gmail phone traffic through). Having this extra bit of location information is extremely useful in screening calls. Just to be clear: the app doesn't show you the physical location of the caller. It just shows you where the area code of the number is used. Android users, the downside to Instant Area Code is that the UI is ugly as sin, the app hasn't been updated in a while, and some blacklist-numbers-by-contact functions appear to be glitchy. That said, if you prefer function over form, and just want to know where your calls are coming from, it will do the job. Trust me, I tried a lot of free and trial version apps, and none of them could do this location-based identification right. Long story short: If you have an Android, BlackBerry or iPhone and you've got Call Display, there are apps to help you identify the caller and/or where they're calling from, and blacklist spam phone numbers (or area codes) entirely. Find one, install it, and spend less time answering spam calls!